Wild Mushrooms! | Have YOU Ben Starr Struck? I am a mycophage. But I’m not alone. You’re probably a mycophage, too. In fact…most of us are. If you eat mushrooms, truffles, cheese, beer, yogurt, or bread…you’re a mycophage. Mycophages eat fungus. My house backs to a large park, the majority of which is overgrown woods. And for almost a year, I’ve been diligently searching for wild mushrooms there. And today, I was finally rewarded! 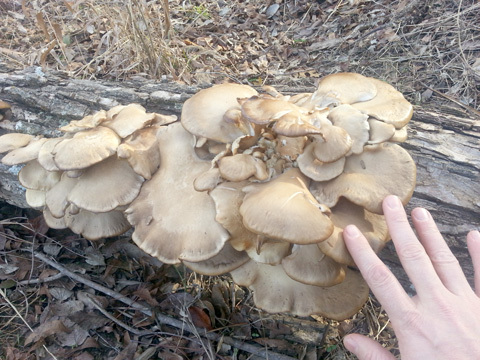 While taking Oliver for an adventure, I stumbled across a fallen log absolutely loaded down with wild oyster mushrooms. -A wild oyster has the scent of fresh shellfish…like the ocean. -It can be found throughout the year, but most often in cool, wet periods from fall through spring. -They vary in color from white to tan to gray, and the “late fall oyster” variety is caramel in color. Best of all, the wild oyster mushroom has NO toxic look-alikes. So if you find a mushroom with all the identifying characteristics above, YOU CAN EAT IT! This patch of wild oysters yielded 3.5 pounds when I got them back to the house. This could easily set me back $50 or more at the gourmet market, so it’s a GREAT FIND! Wild oysters are easy and safe to forage, but many other edible mushrooms have poisonous look-alikes, so it’s important to have at least 2 solid field guides when foraging for wild mushrooms. 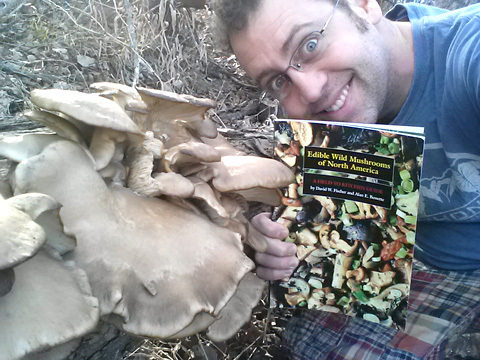 I recommend Edible Wild Mushrooms of North America by David W. Fischer and Alan E. Bessette and The Complete Mushroom Hunter by Gary Lincoff. Wild oyster mushrooms have a curious trait. They are carnivores! They “eat” insects. Many insects are lured to the oyster mushroom by its scent. The insects burrow into the mushroom to eat it…then the mushroom surrounds the insect with new tissue and digests nutrients from it! For this reason, mature oyster mushrooms from the wild shouldn’t be grilled or sauteed whole, because you may run into a buried beetle! To prepare wild oysters, first wash them off, then soak them in heavily salted water. Then slice them up, discarding any slices with “buried” insects in them. From this point, you can grill, saute, or cook any other way that you wish. Wild oysters tend to have a fuller flavor than cultivated oysters that you buy in the store, but are not as full flavored as most wild mushrooms like morels, chanterelles, puff balls, or maitake (Hen of the Woods). 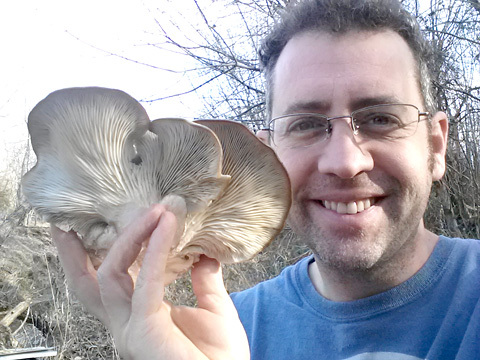 43 Responses to Wild Mushrooms! Oysters will be wet or damp if there has been recent rain after they have fruited. Under normal conditions they will be fairly dry to the touch. Soggy oysters can STILL be cooked, but take much longer because you have a lot of water to cook off. But I’ve cooked many, many batches of rain-soaked oyster mushrooms…just put fewer of them in the pan and give them time to drop all their water. When they start browning, you know you’ve cooked them enough. Not that I know any different just a bold statement. This page seems to beg to differ but I have to admit there weren’t a lot of convincing examples given. Tom, all my posts on mushroom foraging are intended to make sure you have a positive identification before consuming any mushroom found in the wild. Oyster mushrooms don’t have any TRUE look-alikes that are toxic. Now, admittedly, a dog and a cat can look a bit alike…they are both fuzzy, have ears, eyes, a nose, and a tail. But if you look at their basic characteristics, they are easily distinguishable. It’s the same with mushrooms. Virtually all mushrooms have a “cap” and most have something resembling a “stem/stipe,” so it’s easy to say that all mushrooms look vaguely alike. But no toxic mushroom has the characteristics outlined in this post for identifying oyster mushrooms. I’ve seen instructions on the internet and Pinterest for growing oyster mushrooms with coffee grounds and cardboard. Seems handy when you’ve been unsuccessful foraging and want to try a fun project. I plan to try it soon. Make sure not to confuse the deadly angel wing with oyster mushrooms! 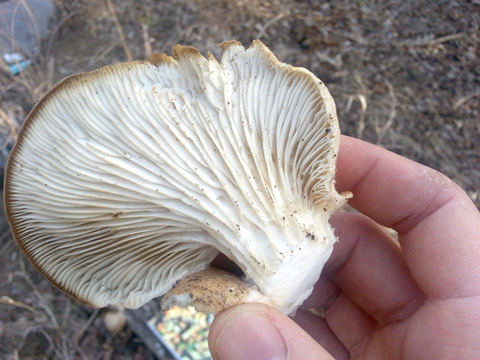 Momo, Angel Wings (Pleurocybella porrigens) are considered an edible mushroom in the US. There were 2 questionable reports of deaths after ingestion in Japan, and these patients already suffered from liver diseases. The link to P. porrigens (Angel Wings) was not definitive. Regardless, Angel Wings are normally grouped into the oyster family and are related, and are a commonly eaten wild mushroom in the US. It’s quite common for one species on one continent to be edible, but on another continent to be poisonous. There have been several mass deaths in US history from immigrant populations foraging a mushroom that was perfectly edible back in Asia or Europe, only to discover that the similar species here was deadly. In the US, Angel Wings are considered edible.